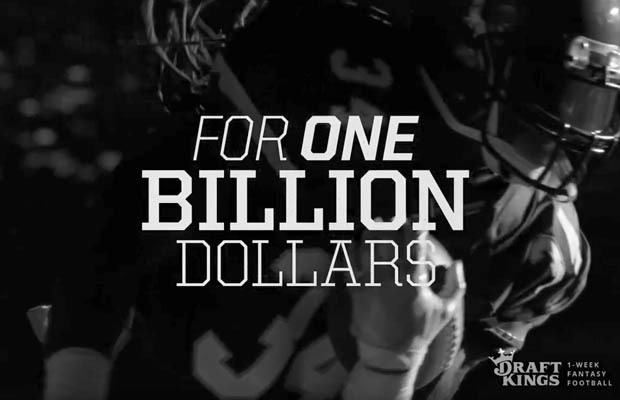 1 A billion dollars at DraftKings? 1.1 What does the “perfect lineup” consist of? 2 How can DraftKings afford to give away a billion dollars? 3 Can someone actually win a billion dollars? 3.1 What if you did try to put odds on it? DraftKings is offering its users a chance to win $1 billion if they enter the “perfect lineup” in a free-to-play daily fantasy football contest for Week 1 of the NFL season. A billion dollars at DraftKings? Yes, you can win a billion dollars at DraftKings, without paying to enter the “Billion Dollar Lineup” challenge. The contest is free to play and awards a prize pool of $100,000 to the users that craft the best lineups, even if they aren’t perfect. But players entering the contest will be hoping to win the billion dollars for hitting the perfect the lineup, or the equivalent of the lottery for daily fantasy sports. What does the “perfect lineup” consist of? Basically, that means you have to pick the top scoring player in terms of fantasy points at each of nine positions (quarterback, two running backs, three wide receivers, tight end, flex and a team defense/special teams) in a DraftKings lineup. That must be done while creating a lineup that fits under DraftKings’ salary cap structure. Because the contest is free to play, users in all 50 states can enter — even those states that the site doesn’t serve for contests that have real-money entry fees. To play, you have to live in the US, Germany, the UK or Canada (but not in Quebec). Anyone over the age of 18 may enter the contest in those jurisdictions (except you must be over 19 in Alabama or Nebraska, and over 21 in Massachusetts). The cap on entries is five million. One entry per user. The options for payment is $5 million a year for 50 years followed by a lump sum for the rest, or $300 million as an initial lump sum. The lineup must be submitted by kickoff at 1 p.m. Eastern on September 10. The contest is currently only planned as a one-time offering for Week 1. How can DraftKings afford to give away a billion dollars? Smaller DFS sites — most notably the now defunct DraftDay — once offered a million dollars if anyone generated the perfect lineup for any of its contests. The contest is also probably insured at a reasonable rate because it’s unlikely anyone will win it. Can someone actually win a billion dollars? Odds of Winning. Mathematical odds of winning the Grand Prize will vary depending upon the knowledge and skill of the Entrant. This is the most challenging promotion we’ve ever offered. You aren’t going to win a billion dollars by drafting a good lineup or even a great one. To win $1 billion, you’ll need to draft the “perfect lineup.” Anyone who plays fantasy football knows how tough the challenge really is. This promotion can be won, but to conquer this ultimate test of skill, you’ll need to be perfect. But DraftKings does not put any odds on the possibility. What if you did try to put odds on it? While being good at DFS certainly would be better than a randomly generated lineup or one done with little research, the odds of hitting on it are extremely low, even for a very skilled player. It’s not clear if anyone has ever actually done this in the history of DFS for an NFL contest. There’s room for debate about how likely the perfect lineup is to achieve. It’s somewhere on the wide spectrum between “impossible” and “a very skilled player will have a good chance.” No matter what you might believe about the odds of hitting the perfect lineup are, they are likely worse than winning a Powerball jackpot, a lottery with long odds but no skill involved. It’s 1,000 times easier to make a perfect NCAA bracket than a perfect NFL lineup. It’s 5,000 times more likely to win a Powerball Jackpot than create a perfect lineup. Everyone on planet Earth could create approximately 200 lineups and it’s still more likely that no one has a perfect lineup. Could someone draft the perfect fantasy lineup and end up a billion dollars richer? Sure. But that is unlikely to happen.